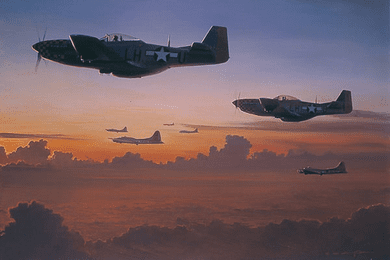 William S. Phillips Counter Signed and Numbered Limited Edition Print:"The Long Ride Home P-51D "
Editions: Artist Signed and Numbered, Limited Edition not to exceed 150 editions. COA Included. About the Artist: "Aviation was my first artistic love," says William S. Phillips, "but my true, enduring love remains my Christian faith, home and family. So it is my pleasure to combine all of it in my work. The historical aviation subjects, I research; the contemporary and nostalgic subjects, I live." Phillips grew up loving art but never thought he could make it his livelihood. At college he majored in criminology and he had been accepted into law school when four of his paintings were sold at an airport restaurant. That was all the incentive he needed to begin his work as a fine art painter. Bill Phillips is now the aviation artist of choice for many American heroes and the nostalgic landscape artist of choice for many collectors. Bill's strengths as a landscape painter are what gave him an edge in the aviation field: respect and reverence for a time and place. When one sees his aviation pieces, thoughts are about the courageous individuals who risked their lives for our freedom. In Bill's nostalgic works, the viewer understands fully what that freedom is . . . the precious values that make life worth living. After one of his paintings was presented to King Hussein of Jordan, Phillips was commissioned by the Royal Jordanian Air Force. He developed sixteen major paintings, many of which now hang in the Royal Jordanian Air Force Museum in Amman. The Smithsonian Institution's National Air and Space Museum presented a one-man show of Phillips' work in 1986; he is one of only a few artists to have been so honored. In 1988, Phillips was chosen to be a U.S. Navy combat artist. For his outstanding work, the artist was awarded the Navy's Meritorious Public Service Award and the Air Force Sergeants Association's Americanism Medal. In 1991, three of Phillips' works were chosen as part of the top 100 in "Art for the Parks," the prestigious annual fund-raiser for the National Park Service, and one painting received the "Art History Award" from the National Park Foundation.